Generally when you train, you probably either move forward or stand in place. You might go for a run with some distant goal in mind, race toward the end zone or goal, or pick up heavy weights and root yourself to build stability under load. But if you’ve ever watched high-level competitive athletics, you know that most lower body injuries, especially the dreaded ACL tear, come during lateral shifts, twists, or collisions. The incredible torsional impact of cutting/shifting on a football field, basketball court, or while skiing come immediately to mind. While not all coaches, especially at the youth level, train lateral movement, this type of training is a huge part of natural movement. This is because our “sport” is supposed to be practiced in nature, where navigating obstacles and changing directions are constants. The workout I’ve put together for this demonstration is based completely around lateral movements. I’ve added the challenge of performing lateral movements while also maintaining balance on a 2 x 4. The balance component forces the participant to work on postural alignment, while the lateral nature of the movements also challenges the peripheral vision. While I’m mostly practicing lateral movements, abduction, and adduction in this video, you’ll see that the “overs” I practice while on the beam work the ‘rotation relative to the longitudinal axis’ element that Zatsiorsky and Kraemer mention above. I will continue to develop these skills in my next video, which integrates more advanced skills, including those of lateral movement with a rotational component. This workout is divided into parts A, B, and C, which will be done in order in circuit fashion for five rounds. Rest :30-:60 each time you complete a full circuit before beginning again at Part A. You will need a length of 2 x 4 (mine is 12 ft.) and a kettlebell (or dumbbell, stone, or some other weight). 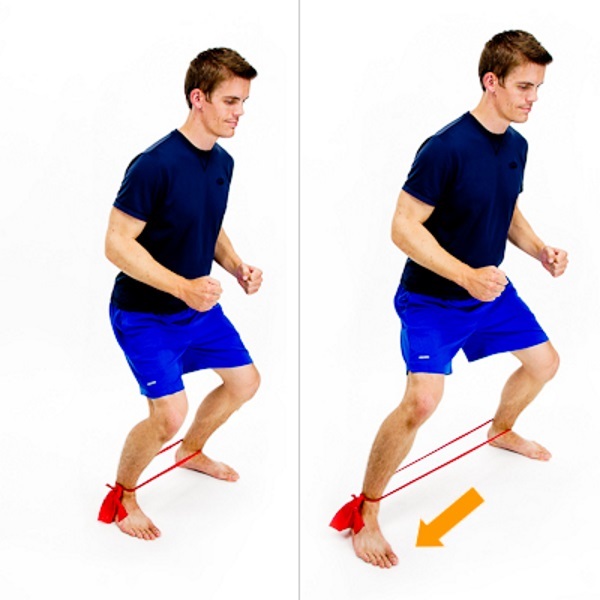 Lateral steps (right foot leads) down the 2 x 4; lateral steps (left foot leads) coming back. Lateral hops (right foot leads) down the board; lateral hops (left foot leads) coming back. Sideways two-foot jumps going right down the board; sideways two-footed jumps coming back. Alternating “overs,” where you laterally step over an imaginary hurdle, switching directions between right foot leading and left foot leading, go all the way down and back in this fashion. 3-5 Cossack squats (bodyweight or loaded) in each direction (not on board). 3-5 lateral plank walks, lateral push ups, or lateral plyometric push ups in each direction (not on board). Lateral hops to split-stance landing on 2 x 4 going down the board; about 3 jumps per side should be good. Make sure that you are aiming for a spot to land when landing on the floor so that you can practice targeted landings. Two-footed sideways jumps landing in split stance going back down the board. Again, focus on precision in landing when jumping from the board to the floor. My landing spot is just 20-22” off of the board. This is a conservative distance to start with. While none of these drills are done at the high speeds of athletic competition, they are awesome foundational exercises to practice in order to achieve a better symmetry between stability, mobility, weight shifting, and postural alignment. If you put the time in to practice these skills, you’ll drastically improve your ability to make these movements effortlessly and at full speed. 1. Vladimir Zatsiorsky and William Kraemer, Science and Practice of Strength Training (Champaign: Human Kinetics, 2006).